Looking for a quick and tasty dinner to be put on the table tonight? We included this Chicken Enchilada Bake recipe on one of our store’s menu plans recently and received some comments from members on how much their families enjoyed it. 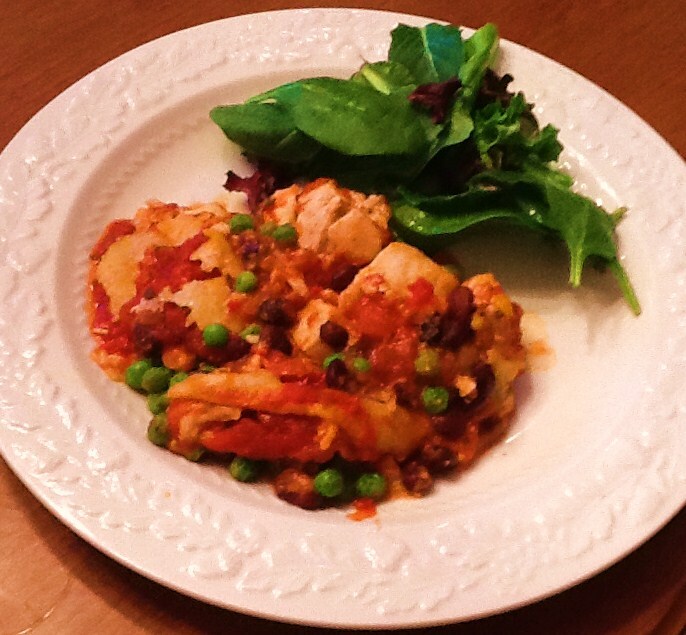 It reminded me when we originally tested this recipe and how much my own family enjoyed it too so I added it to my own dinner plan for the week. We just had it last night on the way out the door to hockey and once again, the plates were scraped clean, even from Daniel my “picky eater”!!! Success! What the kids liked: how the tortillas absorb all the the sauce and are soft and doughy when its cooked. This is also a very easy make ahead recipe and can simply be warmed at dinner time or even frozen for another busy night. Also, because the black beans add a healthy dose of protein, you can use less chicken (I used 1.38 lbs exactly) making it a budget friendly meal for a family. The best part is we had enough leftover for tonight’s dinner so I am treated to a no cook night! Enjoy! sour cream,optional if you want to serve on side. Preheat oven to 350. Cut chicken into 1 inch pieces (does not have to be exact) & season with garlic powder, salt & pepper. Heat oil in large skillet & cook chicken until browned on all sides-about 5 to 8 mins. Stir in beans, 1/2 cup pasta sauce, 3/4 cup of cheese, and frozen peas. Remove from heat. Combine remaining pasta sauce & salsa in bowl & spread 1 cup across a 13 x 9 baking dish. Place three or four tortillas on sauce (Note: if using 6″ tortillas, you will need 3 to 4 for each layer. If using burrito size, use two for each of the layers) & then spread half of chicken mix on top of tortillas. Top with remaining tortillas, the remaining chicken, cheese, & sauce. Cover with foil and bake for about 25 mins. Serve w/ a bit of sour cream, if desired. Perfect with a simple side salad!